The Cachet TV Lift Cabinet by ImportAdvantage is part of the company’s line of $999 TV lift cabinets–offering a fine value without an ounce of sacrifice in craftsmanship. Finished in a rich, hand-applied tobacco color and fitted with solid brass hardware, the Cachet offers surge-protected on-board power for a TV and two components and a full 1-year in-home warranty. 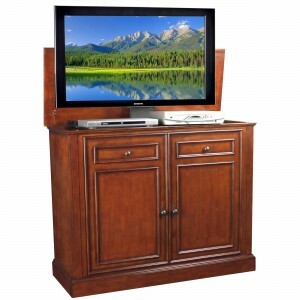 The Cachet is very versatile and its center lift houses and lifts two additional pieces of electronics (such as a DVD player or cable box) with depths of 13 1/4” or less. The Cachet will hold flat-panel TVs up to 45 1/2” wide and 28 7/8” tall, and it comes with the lift systems pre-installed, as well as the built-in Infrared Relay System. The Cachet is built from kiln-dried hardwoods and veneer, and it can accommodate a wide variety of home styles and color schemes. See for yourself the value and beauty of the Cachet TV Lift Cabinet or any of the other fine TV lift cabinets from ImportAdvantage.